Nowadays guests expect more and more from their holidays and want to enjoy lasting experiences: Catamaran sailing offers such an incomparable adventure. By combining an experience in a natural setting (wind, sun, water) with a sporting activity (speed, fun, sailing), lasting holiday impressions are created, which give your guests an added value that will keep them coming back for years to come. Not only in the sunny south, but also on the Baltic and North Sea as well as numerous inland navigable waters, the sailing of catamarans is often the first step in discovering the exciting sport of sailing. The advantages of offering catamaran sailing are obvious: the experienced sailor will be excited by the speed, the novice will enjoy the flexibility and easy handling of the boat and the whole family will be pleased by the ample space they have to spread out. We see ourselves not only as boat builders, but also as a service partner with a wide range of services to help you create sustainable added value for your guests. 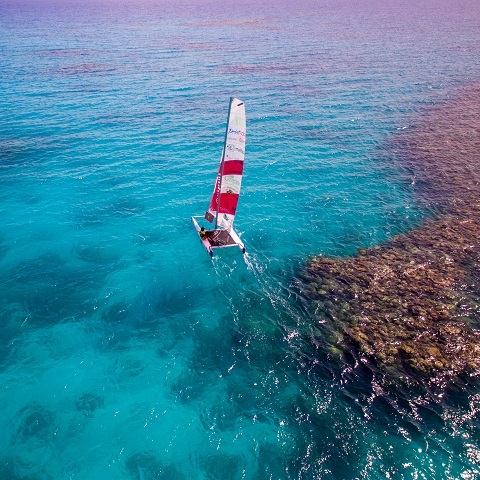 Our services range from a feasibility analysis to determine what kind of potential catamaran sailing would have in your hotel / resort, to assistance in creating and running a catamaran operation, including regular checks of the material and staff training. With the input of our decades of experience, you’ll be able to concentrate on the essentials: satisfied guests that keep coming back! Contact us if you’re interested in adding catamaran sailing to your program of offers. We’d also be happy to sit down with you and take an in-depth look at your current sailing operation in order to reveal opportunities for improvement or how to build on what you’ve got.